This chore organizer teaches children responsible living skills and money management at an early age. Teaching your children responsibility and money management can be a daunting task, and the popular wisdom on the subject is always changing. Should you give them an allowance? Pay them for their chores? How do you get them to save, rather than spending their money as soon as they get it? This inventive responsibility station provides a practical way to establish positive life habits in your children. A dry erase chart allows you to list your child's regular daily chores. Once those are completed, the child can draw additional responsibilities from the "Choose a Chore" bucket, for which you determine a monetary payment. Children are responsible for turning in their weekly "paycheck" from the included pad to receive their money. Three zipper pouches—marked "Save It," "Spend It," and "Give It"—create an opportunity for kids to practice using their money responsibly. The sturdy, wall-mounted set has a cheery, homespun aesthetic that helps to reinforce a positive attitude toward work responsibility. Made in China. The add-on kitincludes everything you'll need to set up one child for success: metal pegboard hooks, metal bucket with matte adhesive label, 20 wooden craft sticks, paper notepad, and vinyl coin purses. Click here to see the new Kid's Responsibility Board. Click here to see the Kid's Responsibility Board Guide. Hang with supplied hardware. Edges of board are very sharp - an adult must unpack and hang this item. Once hung, the edges will be flush to the wall, so the edges should no longer be an issue. I have this board to use a Positive Behavior Board. Helps the children understand family responsibility and takes the pressure/nagging off of me- the mom. Also, a great visual reminder for my son with Aspergers. My granddaughter has problems following thru with projects or everyday things. I think this will inspire her to try or complete things. We are so excited to use the Responsibility Station with our 6-year-old to learn what it means to be responsible for her own affairs. We have made homework one of her daily tasks, and what a difference this has made in that whole process. Rewards for working hard - it works! Also love the concept of setting aside money for giving and for saving. Great life lessons. Also looks great on the wall in her room! I love the concept of this product, but it lacks a pouch for INVESTING. I believe in the 10-10-10 Rule (Save 10 percent. Invest 10 percent and Give 10 percent--leaving you 70 percent to live off). And yes, there is a difference between saving (for "rainy days" and emergencies) and investing (if done right, leads to income generation) and it needs to be taught from the beginning. Add this one feature to the product and it will be the PERFECT financial education tool to start with you family. Great way to get them excited about cores and teaching them about saving. The item is great for my daughter to learn good habits at a young age as they should. She enjoys doing chores and anticipates Sunday (payday). So I guess this is her incentive for now. 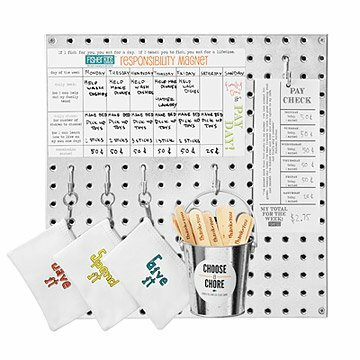 Absolutely love these responsibility boards and so do my children!